We use a three-level structure for collecting and assessing data. 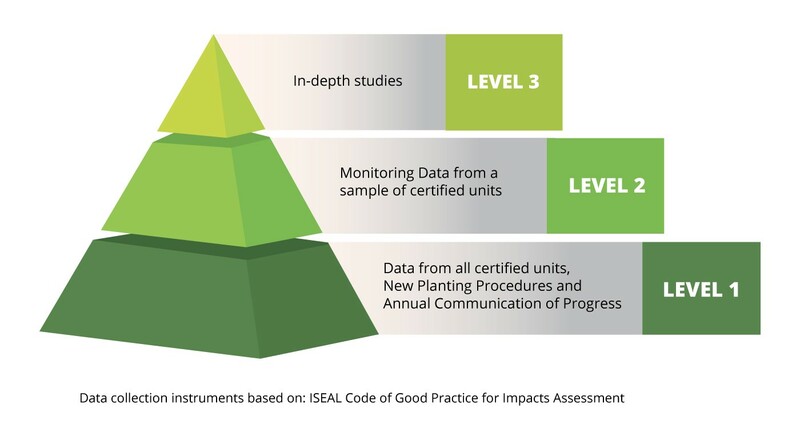 The first level is data that is collected yearly from all certified units, new planting procedures and RSPO’s Annual Communication of Progress (ACOP). The second level focuses on monitoring data from a sample of certified units, while the third level centres around data collection from in-depth independent and commissioned studies. To date, RSPO has collected a large amount of level one data and are making significant progress on level’s two and three. A list of completed research on impacts of RSPO certification, both commissioned by RSPO as well as independently conducted research, can be found at our Research Library. To further drive the collection of level three data, we have established a Research Agenda, which details our priority research questions to help focus, inform and coordinate our research work, as well as to foster collaboration with the research community. In addition, an in-depth, five-year, independent research project; the Socially and Environmentally Sustainable Oil Palm Research or ‘SEnSOR’ has been established since 2015 and the first phase has already been completed. If you have questions or comments about the RSPO's Monitoring and Evaluation System, please submit them to our Monitoring and Evaluation Manager.